The Story of Pruitt-Igoe: To describe the Garden of Indolence’s origins it is important to understand what Pruitt-Igoe actually was. Before Pruitt-Igoe there was an urban neighborhood on the site, albeit blighted slums primarily for poor people, but nevertheless it was an urban environment with places to work, live, and play. Pruitt-Igoe, with its good intentions, ostensibly covered this entire neighborhood with a concrete fabric blanket. Replacing the neighborhood with a large-scale urban regeneration project severed social, urban, and economic cohesion. Ultimately the towers were torn down. What was once a blanket of concrete reverted to nature. The site is a dichotomous relationship between what was once man-made, and nature; the Garden of Indolence unifies the two symbiotically. The Garden of Indolence is a memorial experience that bursts through man-made and natural blankets that have stood on the site since the 1950s. By literally lowering the existing forest eleven stories below the city level the project highlights and emphasizes the relationship between man-made and nature. Not isolating the forest from the fabric of the city, this project rather accentuates its natural state via man-made intervention, and creates unique links between the different neighborhoods that surround the site. Ultimately the effect of the Garden of Indolence is a focused attention and awareness of the forest, and a calm through the warmth of light. A metal chain lowers a sphere of solid, black onyx. Inscribed on the outisde of the sphere are the architectural drawings for what was once the Puitt-Igoe housing complex. The sphere is a clock; it passes by each of the twenty-four levels of the tower every half-hour. It slowly decends from the top of the tower beginning at 3:00am, it reaches the ground twelve hours later. 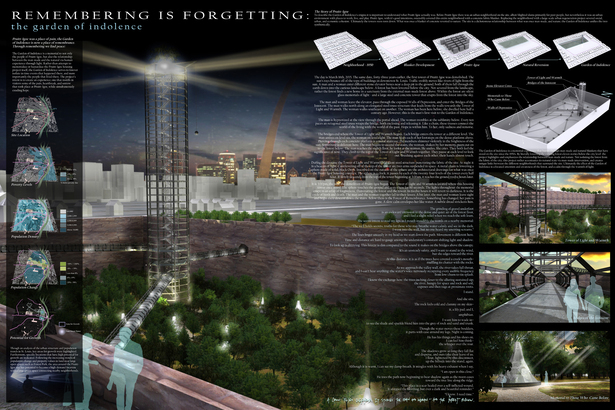 Remembering is Forgetting: The Garden of Indolence is a memorial to not only the people of Pruitt-Igoe, but also the relationship between the man-made and the natural via human experience through light. Rather than attempt to memorialize or bastardize the Pruitt-Igoe housing project itself, the Garden of Indolence serves to forever isolate in time events that happened there, and more importantly the people that lived there. 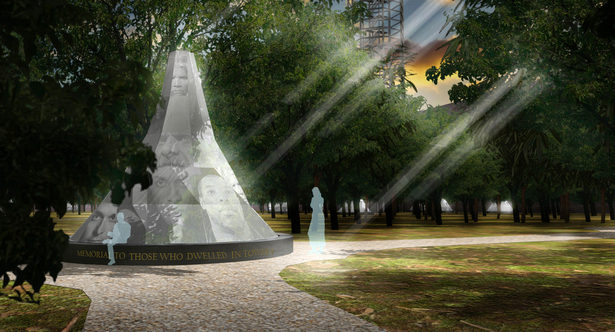 Designed through the poetry of narrative, the project’s intent is to create an experience; one that instills in visitors some of the pain, heartbreak, and sorrow that took place at Pruitt-Igoe, while simultaneously exuding hope.